Follow a pedicab driver, a thief, a laundrywoman, a dog, a blind pregnant woman and Jesus Christ – shod in basketball sneakers – as they make their way from poverty in the city to the imagined paradise of the countryside. 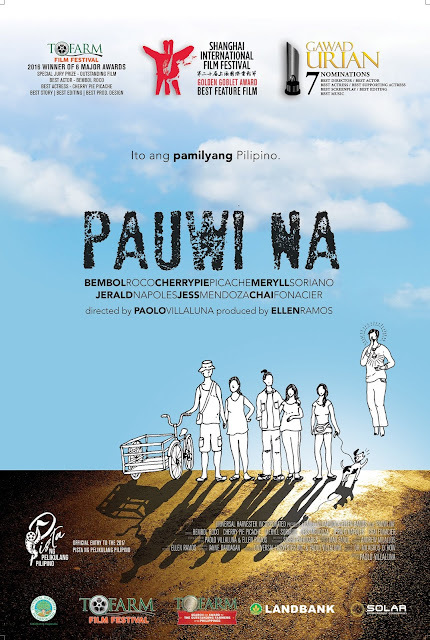 Inspired by a news article featured in the Philippine Daily Inquirer (“Family pedals way back home to Leyte,” Sept. 7, 2003), Pauwi Na (PEDICAB) follows Mang Pepe and his family as they pedal on pedicabs (cycle rickshaws) the thousands of miles from Manila to the farmlands. The ailing Mang Pepe, his wife, Remedios, their daughter Pina, their son JP, his wife Isabel and their dog Kikay live together in a shanty in the slums. Survival is hand-to-mouth. Mang Pepe drives his rusting pedicab to deliver goods to the market. Aling Remedios washes laundry for her neighbors. JP steals, Pina sells cigarettes, and Isabel, blind and soon to give birth, believes she can see and speak to Jesus Christ. Mang Pepe convinces the family that life will be better farming in their home province. Without the money to pay for bus fare or the means to survive on the road, the family piles into a pair of pedicabs, determined pedal their way home. With a powerhouse cast led by Philippine cinematic icons BembolRoco (Manila By Night, Lino Brocka) and Cherry Pie Picache (Foster Child, Brillante Mendoza) PEDICAB is a road trip that becomes an unapologetic look at family, class, poverty and the role of faith in Philippine society.